Eva's Story | Ukulele Kids Club Inc.
As I sit here typing this, Eva is upstairs practicing her ukulele. She has become devoted to the instrument. She practices every day, sometimes for hours, and has learned a variety of songs on it. For her birthday, she received a Luna ukulele that allows an amp to be plugged into it, for Christmas, we had to get a hard case because she carries it everywhere and to school most days. She was musically inclined prior to surgery, if it was you that met with her, she played the keyboard for you. Her music teacher at school has embraced her love of the ukulele and has let her play it during their school Mass. (She attends a Catholic school). She is also the “leader” of a ukulele group the same music teacher has started. I believe she started it knowing that the ukulele and the music is a great thing for Eva! 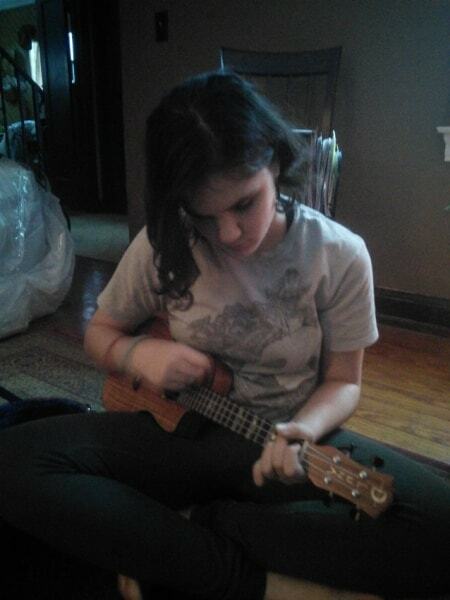 And to think all of this was started because YOU provided her the ukulele and taught her some basic chords. And word has it, many of the other girls in her grade received Ukulele’s for Christmas! You have made such an amazing impact on her life! I would love to share a picture of her playing, especially when she will be performing. If there is any way we can support or put a spotlight on what a wonderful piece you provide in this rehabilitation, please let us know how we can help. She is in 8th grade and next year in high school will do community service as part of their curriculum. If there are volunteer opportunities within the Art/Music therapy department, she would love to participate! She has also had vocal solos at school and at Mass. Her confidence continues to grow and her rehab continues to help guide her! She still has a long road to go, but her progress is months ahead of the doctor’s expectation and I believe it’s because of people like YOU that touched her heart and helped provide her comfort and sharing your mutual love for music.